Anger is a normal emotion we all have experienced. Whether it’s anger at another person for something, or anger over the various injustices in the world, anger is a common human feeling and response. The there is a difference, however, between occasionally getting angry and having anger issues. And for those whose anger goes beyond the occasional, there are some very clear signs that you have anger issues. The best place to look for signs that you’ve got issues with anger is with the people closest to you. Most people can do a pretty good job hiding anger from friends and coworkers, but it's our loved ones who see us when we're the most real. They’re the ones we feel closest to and safest with, so, unfortunately, they’re the ones we’re most likely take our anger out on. And for some of us it happens so often that it becomes a problem. Regular anger can cause difficulties with relationships, families and jobs. So what are the signs that you have anger issues and what can you do about it? Is it possible that because of your anger you could look like this shark to your wife, partner, or kids? 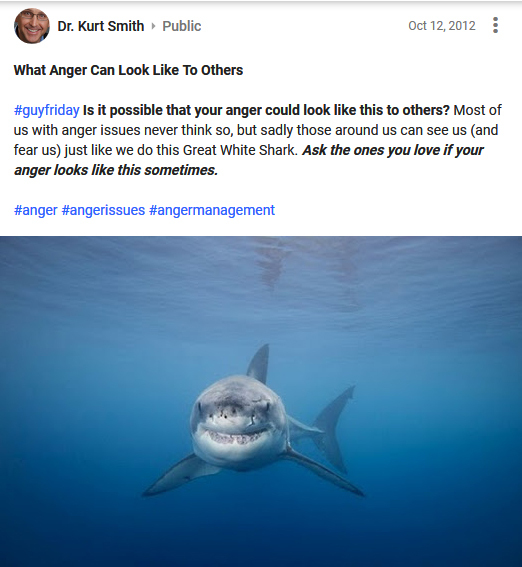 Those of us with anger issues never want to think so, but sadly, sometimes those around us see -- and fear -- us just like we all do a Great White Shark. Who Deals With Anger Issues? It's easy to assume that it's just men who have anger management problems. While it’s true that men’s anger issues can be more obvious, women are just as prone to having problems with anger too. Struggling with anger has less to do with gender and more to do with the psychological issues and life experiences that have shaped us. Often there can be unresolved problems, or even abuses, that have created an internal emotional struggle within a person. Overtime these feelings when left unaddressed can impact our ability to control our anger and respond appropriately to situations or other people. Outside stresses can play a large role as well. People who are already vulnerable can find it difficult to let go of internal anger, or control their anger response when faced with even mild stress. This can happen equally to both men and women. 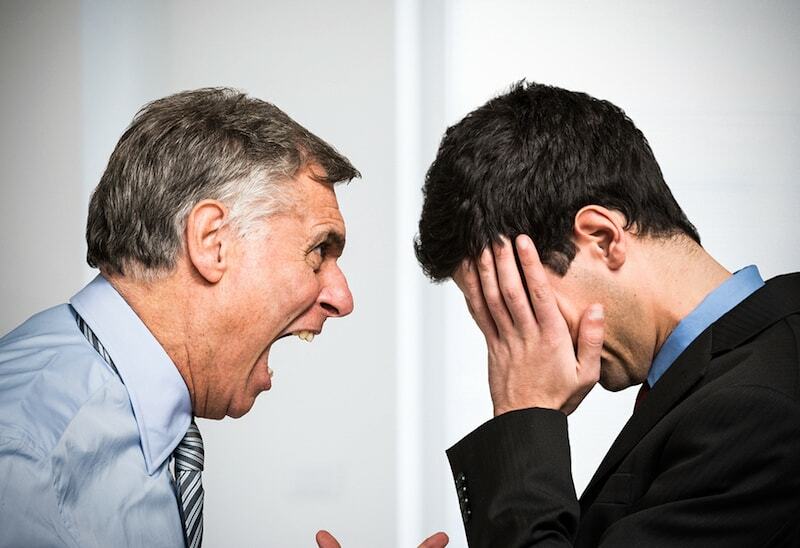 How Can You Tell If Someone Has Anger Issues? If a person is struggling with anger issues there will signs. Below are some real-life examples from people who have a loved one or close friend who is struggling with anger. You'll see that these struggles can be found in men and women alike. "He gets really angry and the name calling can start." "Asking him questions would only get him terribly angry." "I had been seeing signs of anger and temper flaring up rather easily before the incident happened." "How do I communicate these points to him and not get my husband so angry that I cave and apologize for being so awful?" "Most of the women I've met since my ex have complained about the same thing: my temper." "I feel unloved and unwanted [by my husband] because he is angry and grumpy all of the time." "When I came back to start living with him again, I continued to notice the same bitter, angry, self-centered person." "I hate how angry he gets with me when I want to open up about something." "He said I used to become very furious with anger at times and that was the moment when he went to his 'friend' for advice to relax himself." "My wife and I constantly argue since my work changed. I try talking to her and she screams at me calling me names like "dirty dog" in front of her friends and family. She puts the blame of her anger all on me." "This is not the first time it happened, and every time she's gotten angry at me, she would just go away without saying a word and I would always try to make things better for both of us." "Pretty soon I was wrong about everything. I never had the right thought process for anything according to her. She would keep me awake all night on a work night telling me all that I do wrong after I would cook, clean, etc. She is getting more and more violent and angry." Could You Have Issues With Anger? Do you recognize yourself (or someone else) in the quotes above? If you do it’s possible that your anger has become an issue. This isn't a complete list of signs that you have anger problems, but it's a pretty good start. If you recognize yourself, or someone you know, in these quotes or this list of anger symptoms, don't feel too bad. It's not that uncommon. The first step towards change is awareness of the problem. I used to see myself on this list too, but I learned how to manage my anger and you can too. The biggest obstacle for those of us with anger problems is denying that it's true. Learning to stop it isn't as easy as people want to think. So learn about the 3-fold approach we use to effectively treat anger management problems. Was this helpful to learn the signs that you (or someone you love) have anger issues? If so, sign-up at the bottom of this page to receive notice of future posts or follow me on Facebook or Twitter where I share other helpful relationship and self-improvement advice like this several times a week. Editor's Note: This post was originally published August 27, 2015. It has been updated for accuracy and comprehensiveness.